How does she not get in trouble for these kind of stunts? dang this scene is really making me want a chocolate milkshake. Yo, I just caught up. Very nice work. I love how everything is pink. Can you get married when you are dead? I am still waiting for the “Did ya think I just died yesterday?” incredulous response. Awesome colors and webcomic. 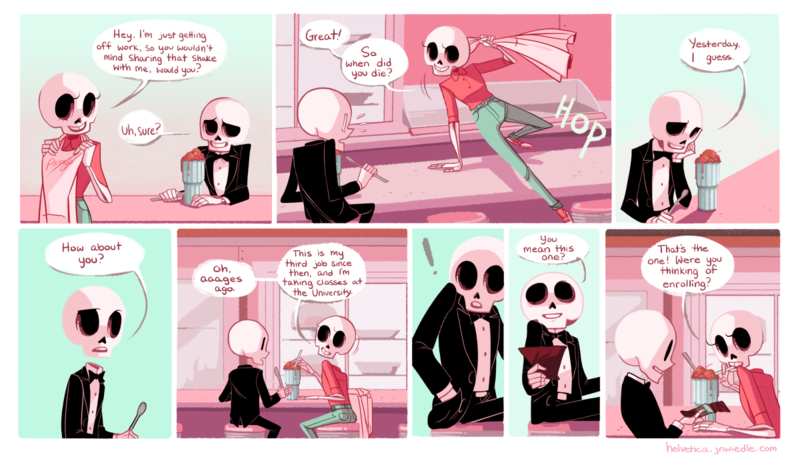 This reminds me of a graphic novel called “Mister Mardi-Grash Ashes: Welcome!” by Eric Liberge – also about a character who finds out he is dead, wake up in the desolate afterlife as a skeleton, and tries to find out what the hell is gong on. Great work! Hope to see more from you. Did the apron come off over her head? or through the neck? Re: How does she not get in trouble for these kind of stunts? Well, she Did say this is her third job since dying. How did autumn jump over the counter like that, shes dead.